Hi there. My name is Jenae. And I am NOT a fun mom. Not yet, anyway. Don’t let the colorful, smiling pictures deceive you. Our paint war fight was way out of my comfort zone. I am a recovering rule-follower, rule-enforcer, safety police with way too high of expectations for those I love the most. God has his hands full with all the work that needs to happen in my heart. But on a very typical Saturday evening, I was so glad I finally gave in to my playful side, because I think our paint war was something my boys will never forget (and what my 18-month old daughter would rather forget–she was a bit traumatized as the photo above captures). 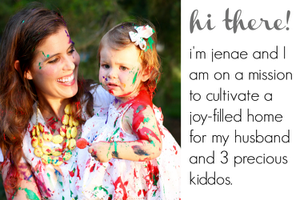 Even though I don’t consider myself a “fun mom”, I am on a mission to embrace the moment and cultivate a joy-filled home through fun family projects, yummy recipes, holiday traditions, traveling together, and more! My husband and I have been married for over 11 years and have 3 beautiful blessings from God (currently 7, 5, and 18 months). Above all else, we are striving to raise them to love the Lord (and have a little fun in the process). 1. I was named after my dad’s French babysitter that he had while his family lived in Belgium when he was very young (his parents were missionaries there for a few years). My name is produced JEN-NAY, very much like how Forest Gump says Jenny’s name…which is ironic since my husband is known for his Forest Gump impression. 2. My husband Kevin and I rode the school bus together all through elementary and middle school. We didn’t start dating until my senior year of high school (his sophomore year of college). 3. My vice is Dr. Pepper. Sonic is a mile away from my house and I have a Sonic Dr. Pepper pretty much every day without fail. I know…I know…it’s terrible. 5. I have pretty much zero musical ability and hardly any athletic ability. I attempted to play the violin and piano growing up, but failed miserably at both. And I have a terrible singing voice (here is the evidence). My older brothers were both incredible soccer players (and I played some, but was never all that great). 6. I might not be musical or athletic, but I can fit my whole fist in my mouth. So…there’s that. 7. In elementary school, my best friend Lindsey and I had a “school” for our younger siblings that we called “Club” on weekends and during the summer. I think this is when I realized I wanted to be a teacher. 8. I have broken 3 bones in my life–my leg when I was 11 months old (my older brother was trying to help me walk and fell on top of me), and my left wrist two separate times. 9. I am horribly afraid of snakes and Brown Recluse spiders (both of which have been uninvited occupants in our home in the last year). 10. Our oldest son, Caleb Brian, is named after my oldest brother Brian who was killed in a car accident when he was 19 years old (I was 13 when he died). He was planning to become a minister and go to Zimbabwe after he finished college. His loss has had a huge impact on my life and the lives of all who knew him. 11. I am what my husband calls “low-maintence” materialistically (but “high-maintenance” emotionally–my words, not his). 🙂 I have never colored my hair and get it cut at Super Cuts once (maybe twice) a year. And he knows not to buy me jewelry (unless it has my babies’ fingerprints on it). 13. Despite being a slightly-better-than-average student in high school, I would have had a 4.0 in college had it not been for Biology the first semester of my freshman year. I accidentally enrolled in the Pre-Med biology class and didn’t realize it until it was too late to drop it. I pulled out a “C” in that class (barely). 15. I thrive on order and routine, but that is pretty much the opposite of how my life feels most of the time. Maybe that’s why I feel so discombobulated all the time?!?! 16. Neither my husband nor I have never lived “on our own”. We were 20 and 21 when got married (so young, I know, but we wouldn’t have changed a thing). We both lived at our parent’s homes during college until we got married and moved into our first home together! 17. I used to be a first grade teacher and loved it so much. After my oldest was born, I finished out the school year and then decided to become a stay-at-home mom after that. Someday I plan on returning to the classroom in some capacity. 18. The book that has had the most profound impact on my life (besides the Bible) is Crazy Love by Francis Chan. I read it several years ago and am still trying to digest it and apply it to my life. 19. I am majorly affected by light and love to have it nice and bright in our home. The blinds in my house go up first thing in the morning to let in as much natural light as possible. Darkness affects my mood. 20. I started the I Can Teach My Child blog on a whim one Friday afternoon over 5 years ago (after having a personal family blog and a failed attempt at coupon blogging). There was no plan–I just typed in a domain that I thought would be beneficial (and kept typing as some of my first choices were taken)…the rest is history. My boys were 2 1/2 and 9 months at the time. This was my first post ever. 🙂 This blog’s story is similar…my husband I were chatting about blogging on our annual family vacation to Colorado and I purchased this domain name before we even arrived at our destination. And for the record, I still fly by the seat of my pants in this blogging thing. But I am so glad that you have joined me for the ride!